Biohacking comes in many forms, from those wanting to hack their work productivity, those aiming to optimize long-term health, and those wanting to correct their bodily shortcomings and deficiencies. This week, we talk to one biohacker whose mission might sound like something straight out of science fiction...adding additional sensors to the human body. 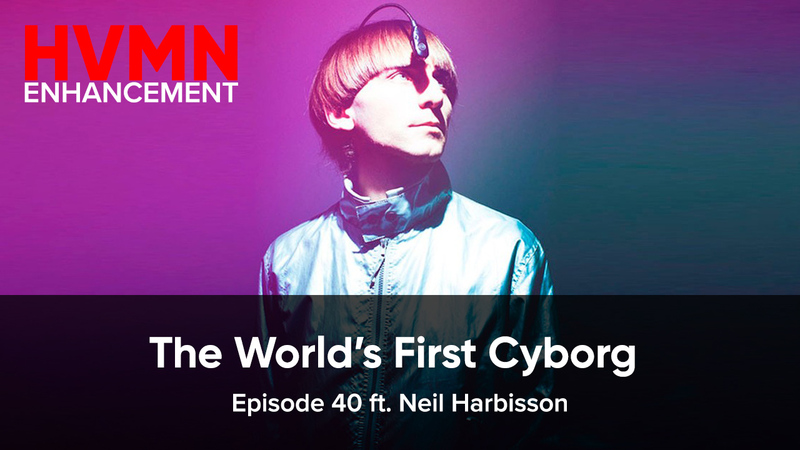 Episode 40 features Neil Harbisson, who is the world's first cyborg. Growing up color-blind, Neil sought to experience color without altering his existing gray-scale vision. His solution? Implanting an antenna in his head that allows him to perceive visible and invisible colors such as infrareds and ultraviolets via sound waves. This initial modification to his body spurred his current passion for cybernetics. He is a co-founder of the Cyborg Foundation, an international organization that aims to help humans become cyborgs, defend cyborg rights and promote cyborgism as a social and artistic movement. Geoffrey Woo and Neil dive into his experiences with his antenna (did you know Neil can detect active/false alarms in stores? ), discuss the ethical and practical appliances of cybernetics, and why adding additional sensors found in other species (antenna = bug) has made Neil actually feel closer to nature than, say, a machine. Geoff: Welcome to this week's episode of the HVMN Enhancement podcast and this is your host, Geoffrey Woo. I'm really excited to be talking to Neil Harbisson, who's been recognized as the world's first cyborg. And, you might have seen his talks and presentation on Ted and different media outlets over the past ten plus years now. So, welcome to the show. Geoff: So, where are you? Looks like you're in some sort of studio, laboratory ... You were mentioning before that you were going live for bunker. Can you describe your situation? Neil:	Yeah, so it's a secret location in Barcelona. Under, so you need to go down some stairs to get here and then we do some things here. Just a few hours ago we were having some implants, so there's a bit of blood on there. Because we do the surgery on the piano, so this is actually a piano. Neil:	But we use it as a bed and as a surgery table. Geoff: How's the cleanliness and the sterility? Neil:	No, it's very clean. We clean it a lot. Like Dexter. Have you seen Dexter? How clean everything? Neil:	So a bit of ... We use a lot of plastic and then we do the things and then we move it. Neil:	So it's very clean, yes. Geoff: Interesting. So who got implanted and what was implanted this afternoon? Neil:	... It was a transplanting a chip from a place to another, basically. Geoff: Yeah. So I'm curious about your story, getting into ... Really, I think just kicking off a serious inquiry into the notion of being a cyborg. I think it's been a part of science fiction for at least decades. But, I think there wasn't a serious inquiry of people actually trying to become cyborgs until, I think, you started experimenting over a decade ago. And, looking a little back into the story, you had an art project where ... I guess, you're color blind and you were seeing if you could create the sensor that could allow you to perceive color through sound. And then, that brought you to a full journey where this became a permanent fixture that has not only just recovered color perception, but also increased your senses beyond what is typically associated with humans. Can you walk through that journey in how you got started along this path? Neil:	Yeah. I guess it became as a ... I was always curious about color, and also I wanted to have a way ... I wanted to sense color but I didn't wanna change my sight. So, I didn't want to create any type of element that would alter my vision. Because to me, seeing in greyscale has many advantages. I have better night-vision. I can see longer distances. I memorize shapes more easily. So, there's many advantages of seeing greyscale, so my aim was never to actually change my sight. I wanted to sense color. And, to do that, I had to create ... I wanted to create a new sensory input, basically, that would not be altering any of my existing senses. So, I didn't wanna use headphones, I didn't wanna use electronic glasses, and also I didn't wanna wear technology, because I found that it would be uncomfortable to wear a sense. Neil:	So, I wanted to create a new organ, a sensory organ, to have a new sense, basically. So, that was the aim. And then I ... First of all, I tried to think of how to sense color. And there's been many theories through history relating color and sound, because they're both frequencies. So, the aim was to create some system that would allow me to feel color through the frequencies of light. And, I needed a new organ, so I looked at nature and I thought that an antenna would be one of the best organs to have, because it's 360 degrees. So, you can be pointing somewhere else when your senses are focusing somewhere else. So, I wanted to have an antenna ... To create an antenna implant, so that I would sense color independently from my existing senses. And that's how it all started in 2003. Geoff: Wow. And, now, it's expanded beyond just sensing color, right? What are the latest capabilities of your antenna? Neil:	Yes. So, I sense from infra reds to ultra violets. From near infrared to near ultraviolet. And then there's also internet connection. So, I can receive colors, not from the antenna, but from external sensors. So people can send colors directly to my head using a mobile phone, or I can connect to satellites, and then I can sense the colors from space. So, the internet as a sense, allows me to separate my body from my sense of color. And then I can be here, but my sense of color can be in space. So, I like exploring this experience of separating my body from my senses. Neil:	Yeah, but this is not AI; it's AS. So, it's not artificial intelligence, it's artificial senses. And that's what I also was very clear from the beginning that I didn't want to know the colors of things. If the antenna was telling me the names of colors, that would be AI. And I was not interested in AI. I wanted to sense and experience color. Geoff: Yeah. It makes sense, right? Because, if you're colorblind, the notion ... The word of purple or blue or red has no meaning to you, right? These are just like concepts that we apply towards senses. So, you're essentially ... So, yeah. Just by telling you, "Hey, purple, purple, purple," and you're looking at something that's purple is meaningless. But actually sensing it, feeling it, you're developing some intuition around what purple feels like. Where that's something that we get, or someone with normal color vision would just naturally perceive, you're recovering that intuitive sense of color. Neil:	Yes, and we are all colorblind because it depends on which species you compare yourself with. Geoff: Yeah. I think that's a great point. It's very anthropocentric to say, "Hey, this is the visible color spectrum." It's a very narrow spectrum of electromagnetic radiation is what we consider color. But, yeah. I know there's, fish have four rods that you can theoretically detect an extra dimension of color, right? That would be interesting. So, bringing it down to a more practical point, so, do you have any interesting anecdotes where you're picking up senses with your antenna that un-augmented people don't realize? Do you have a superhuman, super sense story, where you're walking down the street and you're picking up something that no one else around you picks up? Neil:	Well, the infrared allows me to detect if alarms are ... Well, movement detectors are on or off. And, in most cases, these sensors are used for alarms. Geoff: That's a cool superpower. Neil:	... Or a remote control. If it's the remote control that is not working or if it's the television. I can tell, also, by hearing if there's infrared or not. Geoff: Coming out of the remote. That's cool. Geoff: Yeah. What else is intuitively there. So, I guess you picking up infrared, like motion detectors, remote controls are infrared driven. Anything that uses ultraviolet? Or have you considered expanding into like, X-rays or gamma radiation or is that just too noisy? Neil:	... But then, always detects the dominant color. So, in order to hear it, it would be ... It would have to be the dominant color around me. Neil:	So, if there's a lot of ultraviolet, then I will hear the ultraviolet. If it's ... So if I go beyond, it will always, I think, be based on the dominant, but yet relative. Otherwise, at some point, I would only hear ultraviolet during the day. If it was ... because ultraviolet's something that's everywhere. Geoff: Yeah, if we've been following the news, recent tragedy there. So, I hope everything is okay in Barcelona. Neil:	Yeah. It's slowly recovering. People are. Geoff: Okay. Yeah. So, it seems like ... What are other external senses that you've seen have become interesting or you're looking into? I know one of your collaborators has sensors in her elbow that detects earthquakes. What other interesting senses have you worked with or come across? Neil:	... To moon-quakes. So, Moon will be sensing moon-quakes now permanently from September 15th. So, she will feel these vibrations in her foot. Neil:	So, whenever the moon vibrates, her foot will vibrate. So, instead of physically going to the moon, the moon will come to her feet. Neil:	So, that's a new way of exploring space. Neil:	Also, I'm creating an organ for the sense of time with Orean in New York. It's going to be circular, and it's going to give me a point of heat that will slowly go around my head. And it will be between the skin and the bone, so I will feel the sun going around the head. It will take 24 hours. So, it's going to be like having a solar clock inside my head. So, feeling the heat here means that ... If I feel the heat here, it means it's 12 o'clock in London. Neil:	... Into practice to see if we can alter our perception of time if we have an organ for time. We should, in theory. because we have eyes for sight, and we can create optical illusions. I'm sure we can create time illusions if we have an organ for the sense of time. Neil:	So, that's my new experiment. Geoff: That's interesting. Hm. Yeah. Would you imagine you'd be putting yourself into a black box where that time sensing organ is dominant? How would you ... I'm curious how would you imagine setting that experiment up? Neil:	Well, we are here in ... under. Neil:	So, there's no way of me knowing ... what time. There's no clocks here in this space. So, I will be here in this bunker for some days or weeks if I can, before some weeks, so that I can have a full experience with my solar crown. Geoff: How's that going to ... That seems like a pretty interesting operation and implant. Can you a share a little bit of more details around how that exactly is going to work? Geoff: Not feel it? Yeah. Geoff: I see. That makes sense. Interesting. So, I'm actually curious. So, it seems like with a lot of your efforts, you've been focused on external or artificial senses, and a lot of folks in our biohacking community around ... especially people that are trying to manage their metabolic syndromes, are very much, in terms of ... Or, are interested in understanding and quantifying their internal metabolic state, right? Like I was mentioning before, a lot of people sort of have quasi implants with continuous blood glucose monitors or understanding their metabolic panels. And a lot of interesting research in Silicon Valley of having to continuous measure of receiving their blood glucose or blood ketone levels as it evolves through the day in response to eating or fasting and everything that you do normally. Have you looked into any of that internal sensing? Or what are your thoughts in that realm? Neil:	Well, I see it as an input. Neil:	So, using technology to receive things that my body cannot sense. Geoff: But I think it's also like a new sense, right? It's like just as much of a sixth sense if we just now have a quantitative understanding of, "Okay, this is what my glucose levels are, this is what my ketone levels are, this is what my lactate levels are." Neil:	No. A sense is stimuli from the outside that comes into our body. That would be a sense. Wouldn't it? Geoff: Well, I would say you can feel things inside, right? There's a sense of pain coming from internally, right? I would say, if you go from the broadest perspective, it's a new input channel of ... I guess it's like our brains themselves are just a sensory node, and there are things that it can detect from the outside or inside our body. But, they're just still inputs into the brain, if you see what I'm saying. Neil:	Not fully. But, yes, I think there's a difference between also ... because, we have not five or six senses. Yeah, we have many senses. Neil:	Like sense of time, the sense of humor, even. Neil:	There's many ways of defining sense in a broad way. Neil:	Or, you can simplify it with the five sensory organs, or six sensory organs. Neil:	Which is there's maybe not more detected, there may be six sensory organs which are based on receiving stimuli from the outside. Neil:	And then processing them. And that is the part that I'm mostly interested in. Neil:	I find that there's so much that we cannot sense from the outside that would change the way we perceive reality. Neil:	I don't know if my sugar levels would change my sense of ... I'm sure it's interesting but ... I don't know. Geoff: An argument over ... Or, I wouldn't say there's like a hierarchy of value or anything. I think it just ... It's interesting that there's broad groups of people interested in increasing capabilities of humans, Right? Like, yeah, you can talk about externals. You can make a bifurcation between external inputs or inputs coming in from the body. But, yes, I would say that we all intuitively feel, like, when you're eating a high-sugar meal, or when you're cranky in the afternoon because you're low on blood sugar. We intuitively feel that, right? Just in our mood and in how our body moves. But, I guess it's sort of the biohacker, in our sense, is really saying, "Okay, let's quantify it, and how do we understand it, and potentially manipulate that for better performance through the day?" But, yes. I think, I absolutely understand from your focus is like "How do we add new external stimuli sensors to do things that normal people, or un-augmented people won't be able to do?" I'm curious, in the sense of describing yourself as an artist. So, did you always have artistic aesthetic as you've ventured into the space? It seems like there's some segment of what you're doing is performance art in some sense, right? And, some aspect is really ... I presume, thinking that this is the future of humanity. How do you navigate these different tensions? Neil:	I see these as art. The creation of this, this is an artwork, but it's inside my body. The creation of the sense is an artwork, but it's inside my mind. So, it's, for me, the creations of a new sense is an art itself. The creation of an organ is an art itself and the design of your perception is an art. So, I call this cyborg art because I think it's an art itself. I think we'll see many more artists that will create new senses and new organs, and will design their perception of reality and that will be their art. The issue with cyborg art is that the artist is the only one experiencing this art. So, I'm the only one experiencing the vibrations inside my head. Neil:	So, it's a bit of a post-art because it breaks the tradition of art. Which, in the tradition of art is the artist, the audience and a space to perform. In this case, I'm the artist, I'm the audience, the only audience of this art and I'm also the space where it's happening, so it breaks with the tradition of art. So, it might be seen in the future as post-art and we'll see many more people. Neil:	Perceptionism. Because the aim is perception and you cannot really sell perception. So, it also breaks with are because it's an art from that only the artist can experience inside the mind or the body. Geoff: That's an interesting way to look at it. Then, when you're giving presentations and talks there's definitely a performance to the meta audience, if you will, right? Like, yes, I do not perceive your sensations around your specific art, but we do see the ... Like, we meta see like, the composition with the artist, the space and the audience in you. So, there's like different sort of layers to what we're viewing. In some sense, when you're on stage presenting your work, you're also an artist at that level, right? Neil:	Yeah. I guess the only way I can share the art that's I'm experiencing is by explaining my experiences to an audience. No other way of actually sharing it. I've done paintings and I've done some color concerts that can, in a way, reveal part of this experience. But, the actual art is in here so, it's impossible for me to share. Neil:	In the way I'm experiencing it. As you have an antenna implanted in your head, that would be the closest thing to experiencing that. But, yeah. This artwork, whenever I die, will be ... Whenever ... I mean, the same way that you can have organs that are donated when you die, this will be in the list of organs to be donated so any other artist or person will be ... Willing have it implanted in their head, so the artwork will continue. In the body of someone else. Geoff: Interesting. That's a cool way to look at it. I mean, it seems like in one sense, that synesthetics, people sort of perceive color as sound ... What is your interaction with people that have synesthesia. Is it a ... How is that conversation like? So, synesthesia is sort of like, the people that claim they can hear colors or see colors that describe to music. Neil:	Yeah, I say that I hear colors to simplify it, but I'm actually feeling a vibration inside my bone that then becomes an inner sound. So, it's different from my sense of hearing. So, me hearing is through the ears. This is a new sense, but the closest is hearing because I can actually hear as a secondary effect of the vibrations and inner sound. But, if I was completely deaf I could still perceive color and if I was completely blind, as well. So, it's an independent sense. I don't need to hear or to see to sense color. So, it's difficult to compare, but in synesthesia it's the union of existing senses. In this case, it's the creation of a new one. But, yeah. The closest would be people who can hear sounds as color or, who, when they look at the color, they hear some sounds and I've met some people. But, the sounds that they hear do not match the physical sound of a color. So, if we could hear red, hypothetically, we could hear the frequency of light. Red would be a note between F and F-sharp. And, I've never yet met a synesthed ... Someone with synesthesia that has the same scale as the frequencies of light. Geoff: Right. Which, it makes sense. I mean, I think yours is ... Yeah, there's like a very mathematical notion of your ... How you're picking up and amplifying sounds. Or, colors into vibration. Yeah, it is relatively unknown how synesthetics are actually perceiving their sense, right? Like, there's ... the skeptic in me is sometimes saying, "Are they making it up? Is something that's misfiring?" It's hard to tell. I think, in your case, there's actually a vibration that's calibrated to, as you're saying, the frequency of light. So, it's like a very mathematical notion of what your sense is doing. Neil:	Yeah, I think ... Some doctors say that we are all born with one sense. Which is, all of them together and then from the moment we're born, our brains start separating these sensory inputs and some people don't separate them completely. So, they might have vision and sound quite together. And then, some people have some connection with sound and vision. So, I think they're not making it up. I think it's true that some people might have senses quite together. Neil:	But, they never really match the frequencies ... Mathematical transposition of light to sound. I've never met anyone with this. Geoff: Interesting. So, I think since you've ... You know, have an antenna since 2003, it seems like more and more people are starting to experiment and become cyborgs. I'm curious, how large is the collective and how is the movement, if you'd call it a movement. How do you see this growing? Neil:	Yes, it will definitely be an art movement. Because, now that I've met many artists that they've at least created the prototype and they've worn the sense. And in one case, since last two weeks ago, he already has it installed, which is Manuel Munoz an artist that has a way of sensing the atmospheric pressure changes. So, he feels either if the pressure is going up or down. So, this allows him to predict if it's going to rain. It allows him to feel his altitude. Neil:	So now he's in the mountains and he's actually experiencing his new sense and he's enjoying this. And he will create ... Well, he sees this an art itself the creation of this sense. But, he can also then create, maybe, external artworks. He's a photographer, so he might make a new type of photography. Yeah, I think in the 2020's is the decade when we'll see this becoming more common and more normalized. Now there's some people around the world doing some experiments and we've been giving a lot of workshops in art schools as well, and there's an interest. But, eventually there should be a career or a degree on the creation of senses. Senses designs or species design; designing what species you want to be, what organs and senses you want to have. So, I think there will be ... or, a cyborg art degree, specializing in the creation of senses and organs. Sooner or later, I'm sure there'll be a university with this specialty. Geoff: I think it's interesting. So, I agree with you that at some point everyone will be a cyborg to some level. I think there's a couple ... I'm curious to see how you think the future will play out. There's on painting of the future where everyone is sort of like this androgynous ... Everyone has like the same implant, same capabilities, or I think what seems to be more likely to how I see the future unfolding is that there's going to be more, and more diversity with people implanting all different types of sensors. I'm curious, as you project out ... Yeah, 2020, 2030, how do you see the world unfolding? Do you see everyone on the street with antennas and air pressure gauges and ... Paint that, paint 2030 for us. Neil:	Well, I think diversity will be much greater. So, what we now call diversity is nothing compared to what we will call diversity in ten or twenty years. People will have their own senses and organs. So, that's something we need to prepare ourselves with that we will meet someone and this person might have a sense that you don't have. Or, an organ that you don't have. And, I think many people will start identifying themselves as trans-species. Which is, the addition of senses and organs that are not traditionally human. In this case, this is a trans-species implant, like the surgery was a trans-species surgery, that's how I define, because it's the addition of an organ that is not human; an antenna. And, the addition of senses that are not traditionally human; ultraviolet and infrared perception. So, in this case, it's adding senses and organs that are traditional for other species. An antenna, there's many insects that have antenna. Or, infrared and ultraviolet perception is completely normal for other species, so I think we'll see many people adding senses and organs that might be normal for other species. But, they're not traditionally human. And, also senses that are entirely new. Neil:	Yes. When people stop using technology as well, when we start adding this senses by genetically modifying ourselves, or by implanting antennas that are made from our own DNA, so when we can see the print organs with our own DNA, new organs, and add senses by modifying our genes. Then, if this person with these new senses and organs wants to have a child, we don't know if these new senses or organs will be dominant and a child can be born with an antenna or with a new sense because of the genetical changes. So, we are the renaissance of our species, the beginning of a huge change and some people are aware of it, others are not. But, to me it's very clear that it's happening. Neil:	Yes, I think deficiency. But it's that we still cannot survive in this planet. That's ... We've been changing this planet in order to survive. The philosophy, I think, of a cyborg should be that we should change ourselves in order to survive in this planet not the planet. In this case, now we're using artificial light because we have no night vision. So, if we had night vision we wouldn't have to change the planet. We wouldn't have to create or waste energy to see at night. So, I think slowly society will see that we need to change ourselves instead of changing the planet. Instead of using heaters and air conditioning, we should be able to regulate our temperature. So, that's, I think, one of the social aspects that I think will also give more sense. It will make more sense to become a cyborg if you want to stop changing the planet and start changing yourself. Geoff: Yeah, that's interesting, right? It's a lot more efficient energy wise to manipulate ourselves rather than change this huge space around us. Yeah, I'm actually curious in terms of opening an ethical can of worms, when you have children, are you going to give them antennas or is it going to be up to them? If you've thought about it, how would you navigate that? Neil:	Yeah. I would never force anyone to have an antenna so it should be their own ... Anyone's decision. One's own decision to have what senses and organs one wants to have is ... I would not influence this. But, if this was genetically added, so if I added the infrared and ultraviolet perception genetically, and I implanted this antenna by 3D printing it with my own DNA, we don't know if I have a child, if this child would be born with the genetical changes that I made to myself. Neil:	In a few decades, maybe at the end of this century, children will be born with new senses and organs because the parents genetically modified themselves and then if they decide to have children, these new children will be born with this new senses. Geoff: Yeah. I mean, I think you already see this happening for ... As a therapeutic, I think there was the first CRISPR human embryo just recently. So, there are genetically modified humans and these are more designed for ... as a therapy, right? Like, recovering some sort of disease. But, then I think you make a great point. We're all deficient in some ways. Like, what is even the norm of ... What is even normal? It's like a cultural artifact of normalcy. Like, that is going to be very fuzzy as people sort of, redefine was normal is. So, people maybe will be ... Yeah. CRISPR-ing their kids. That isn't going to be ... That wouldn't surprise me. At all. Geoff: Interesting, interesting. So, does that mean you have more of an affinity towards animals? Geoff: Okay. Interesting. So, I don't know. Are you vegan? Do you not eat animals? I'm actually curious how that applies into like a day to day. Neil:	Since I sense infrared and ultraviolet, I feel also much more connected to these species that sense these colors. Because, we now share a sense. So if I see an animal staring at the wall and I sense there's infrared in that wall, I'm sure that the animal is staring at the infrared. Not at the wall. So, I share an experience with other species that I didn't before. So, the more senses we add, the more we can connect with other species. Not with machines. I think, many people think that becoming a cyborg bring me closer to a machine, but I feel like it makes me much more closer to nature and to other animal species. Geoff: I think that's a great way to look at it. That's interesting. So, in terms of like, fellow antenna'd species, do you feel more affinity to bugs and traditional creepy things, then? Neil:	Yes, some people shout at me what's the name of that fish? This angler fish. They call me angler fish as ... Trying to, I guess, insult me, but it actually ... I don't feel it's a bad thing to be close to a fish. I do have some organs that are now very traditional for other species. Yes, antennas ... If I see an insect with an antenna, I feel closer connection than I did before. Yes. Geoff: That's really cool. I've been thinking about, you know, like factory farming and our treatment of other species as a human society and it is pretty brutal. And, you can imagine in 100, 200 years if we're 3D printing all of our food, etc. That we would look back at factory farming practices as essentially enslaving cattle and pigs and chicken and putting them in a small box, and having them breed and pump out their children and eat them and kill their children ... As a pretty unethical practice, that today is common place. So, absolutely, I think that kind of broader thinking of thinking across species as opposed to just being very human centric is, I think, what the future will kind of look like. I'm actually curious, I appreciate that you actually kind of live to that standard where like, you don't eat other animals. Because, I think for me, I think about it as moral problem, but like, I'll still partake in eating them. Haven't gotten around to overcoming that hypocrisy. So, I appreciate that you actually believe it and actually carry it through in your every day living. Neil:	Well, I hope you do it as well. I don't know, I'm not good at convincing, but I think you shouldn't eat other species haha. Geoff: Yeah. No. Yeah, absolutely. I'm curious, in terms of mortality, have you thought ... I mean, as we're developing more and more capability to alter ourselves, what do you think of the notion of enhancing our longevity ... Would you want to live forever? I'm curious if you have any thoughts or philosophy around that. Neil:	Yeah, I think your audience is focusing on making your body living longer, but I'll be working on a different way. Which, is to ... Instead of making my body live longer, I want my brain to believe that I've lived longer. So, that's why I've created the sense of time. If you can create an optical illusion, because you have eyes, you can also create the time illusion if you have an organ for time. So, you could potentially make your brain believe that you've that you've lived 200 years. If you have an organ for the sense of time and you make time go faster or slower, you could sense that you've lived 200 years. And, in this way, you don't have to make any physical changes. So, that's what I'll be testing once I have the sense of time. I will not only be able to make a situation last longer, or shorter, I will also, in the long term, be able to change my sense of age, in theory. So that's a way of living longer, is either to make your body live longer or fool your brain. Which, is what I'm going to try to do. Geoff: Interesting. At some point you should experiment with turning it backwards. See, if you just like ... Your brain freaks out, it's like, "Oh, I'm going back in time." Neil:	Like, changes. Like, an hour might last a bit more, a bit less. Or, five minutes will last six, so it's to see if I can actually feel that time is stretching or not. Geoff: Right. Yeah, is there anything else in terms of, you know ... It sounds like that's one of the big projects. Any other exciting cyborg projects that you're personally excited about that you want to share? Neil:	Moon and I created the trans dental communication system a couple of years ago and we're perfectionizing it. It's ... So, I have some spaces here, no tooth. So, I have space to create a new implant. So, we created two teeth. One in Moon's mouth and one in my mouth. Then, whenever I click, Moon receives a vibration in her mouth and whenever she clicks, I receive a vibration. So, we both know the morse code. So, depending on the rhythm, we can actually send words to each other and we call this the trans dental communication system. It works with Bluetooth. So, it sends the vibration to your mobile phone, from your mobile phone to wherever she is and then she receives it from a mobile phone to the tooth. So, it works through Bluetooth. So it's a Bluetooth tooth that allows it to communicate from mouth to mouth. Geoff: The roof of the mouth. Okay. Neil:	When you're speaking it works a bit different, so we're trying to make the battery system. Maybe, it will charge by clicking as well. Neil:	We have to ... Maybe, brushing our tooth will ... While brushing it we can charge it. So, we're trying to find a way of charging the tooth. Geoff: Interesting. Great. This is a fascinating discussion. I want to be respectful of everyone's time here, so, how does our community learn more about your work and follow the progress? I think the time dilation experiment sounds very interesting. How do we, and all the listeners keep in touch? Neil:	I don't know, as I'm not on Facebook or Instagram since January the first. So, I'm offline but I'll ... I don't know. I don't know what they could do. Geoff: Alright, so I guess we'll have to reschedule in the next .... Yeah, we'll coordinate and get an update as you progress. I mean, people would be interested in following. Neil:	Yeah, I'll be online again on January the first of 2018. So, by then I'll have Facebook and Instagram. I usually post things there. But, this year I'm offline. Geoff: Why. Just to unplug for a little bit? Neil:	Yeah. Because, just this year I decided I would be offline for a long list of reasons. But, I'll be back online in 2018. If, I'm alive. Geoff: Awesome. I appreciate the work you're doing. It's edgy, it's pushing the limits of humanity and I think we need more and more people that are pushing the extents of humans. I mean, I think there's too many people sort of happy with the status quo. So, keep being you. It's awesome. Geoff: Yeah, let's stay in touch. I'm super curious to see how your experiments in hash out and help spread the message here. So, we'll talk again soon. Geoff: Thanks, Neil. Cheers. Bye. Geoff: Yeah. Neil is a character. That was a fun guest to talk to. Thanks to Zhill, our producer, for bringing him on our show. As always, follow us on Youtube, Apple iTunes, Google Play and SoundCloud. Share some questions. It sounds like Neil will be offline for the next few months, but we'll definitely keep in touch and update you on the progress. I think he's doing a lot of interesting, edgy, somewhat crazy stuff. But, hey. Like, that's how innovation happens, right? You've got to have people pushing what's ... the limits. Thanks so much, see you guys next time.